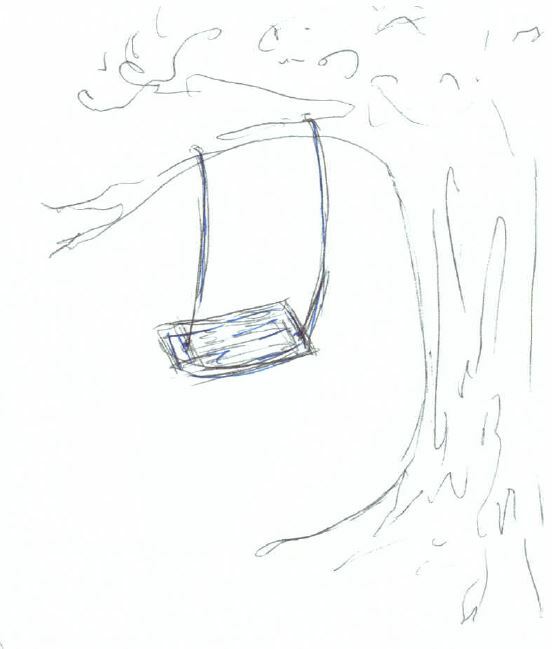 Jesus sat on the swing. His white robe billowed as He rose and fell, up and down, a constant metronome in beat with His Father’s musical heart. I watched Him as He swung so steadily, so purposefully, and so gracefully – rising and falling, up and down. His eyes were fixed on the horizon, his face bright and calm. He seemed relaxed, yet focussed, as He lifted His knees and curled them back under again, keeping the momentum alive. “Lord, what are you looking at?” I asked. He turned to me immediately, His eyes shining with the wonder of endless years in glory. I could feel His lovingkindness in His gaze, and I could see the beauty of the universe in the reflection of His eyes. He smiled with a warmth that penetrated my heart and gave me great joy. “What is on the other side, Lord?” I saw multitudes making their way across the mountain, but I could not see where they were going. He stopped swinging, and walked over to my swing. I nodded, and gently, I began to rise and fall, just like I had seen Jesus doing. I felt His strong hands on my back pushing me higher and supporting my fall. As He pushed, I saw my view widen, my eyes sharpen, and my vision clear. I saw over the mountain, into the valley, and past the horizon. All of a sudden, I found myself walking in a field. The swings were gone, but I felt the same momentum of life, the same strength of His push, and the same assurance of my Lord’s eyes. To my right, a clear stream danced its way over smooth pebbles. I saw the mountain before me and I walked towards it. All the while, I felt peace and comfort, a serenade-like song that propelled me to dance. There was an abundance of space around me. I could run, leap, and spread my arms towards the heavens. The field was boundary-less, and I felt at ease to release the exuberant joy that was stretching my heart. I hardly noticed the fading grass, and the rocky ground beneath me as I continued to dance. Then, an eagle shouted its warning overhead and my feet froze. I surveyed my new landscape – barren and dry. It was silent, apart from the occasional whisper of wind that stirred up the dust. I lost sight of the mountain, and stepped forward cautiously. The momentum slowed, and I felt a great loneliness come over me. There was an abandonment of heart, as the joys of my life seemed to fade into the sand. “Lord, are you really here?” I asked. I had no friends, no support, no vision. I wandered through the desert, and gazed into the blackness of its dry, cracked fissures. The eagle flew on ahead, the only sign of life I could see. Its gaze was piercing, and its cry seemed bitter. Yet, there was some comfort in its presence and I drew some strength to continue on. The wandering seemed to last forever, but my legs would not stop walking. Whenever the wind stirred, my eyes filled with dust, and the tears came to clear them. I grew hungry, and I grew thirsty stepping through the sand. Strangely, my vision, though strained, seemed somewhat vibrant. I caught glimpses of people rejoicing, glimmers of the stream, and fragments of promise scattered through the drying wind. There was colour in the desert, but I needed faith to see it. “Who can live here?” I wondered. The desert was gone. I turned around and saw its dunes, shifting with the wind like a changing maze. There was beauty in the desert, and an awakening of my heart. The eagle gave one last cry and turned back to guide the next desert pilgrim. I felt my thirst quenched and my hunger satisfied. The taste of the Lord’s goodness in the desert lingered, and I felt myself longing for more. A little bird chortled at me. It glided gracefully through the trees and I reached out towards it. Singing its cheerful song, the bird deposited a small package of seeds into my hand. I saw the fallowed ground before me and began to scatter my seeds. The sun was hot, but I persisted to sow. I saw a myriad of plants grow up – saplings, and trees, flowers and thorns. Their cacophony of colours was enchanting. I spotted a weed amongst the plants and frowned. I did not remember planting weeds. As I reached out to grab it, the weed stung me with its thorn. Undeterred, I pulled out the weed and left it to wither. I looked again at the beautiful garden I had planted, enjoying its shade as I watered the growing plants. I heard the Lord’s footsteps as He walked alongside me, and I saw the crown of thorns upon His bleeding head. Protector and refiner – my Lord was always working, meticulously ensuring His garden was well-rooted, well-watered and well-kept. His garden bloomed with the beauty of His love. Every plant dropped seed and produced another. His garden was bountiful and pleasant. His blood kept it pure, and His water made it grow. 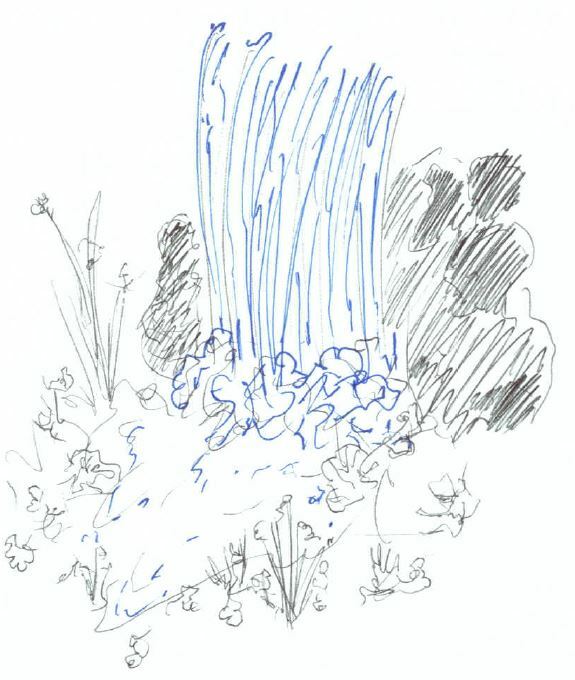 I continued through the garden and arrived at a flowing waterfall. I felt His sadness at the waterfall. It was a lonely retreat, shaded by the forest, hidden amongst the leaves. Yet, it poured out its water freely and beautifully, casting its sorrows into the translucent pool beneath. No-one came to the waterfall, no-one drank its water, and no-one was there to admire its beauty. Yet, the waterfall continued to flow. It did not care about praise from others, but made itself vulnerable before God. He maintained its steady stream, and its clear waters. The waterfall reflected the glory of God in the skies, and He looked deep into its water. I dived into the waterfall’s pool and felt its depth submerge me. I felt God’s love penetrate to the darkest corners of my soul and illuminate them. The current carried me past caves of hidden wonder and when I emerged, I found myself in the depth of an ocean too great to measure. It began to rain, but I did not feel cold. I felt a life in the rain, like the Lord was baptising me with revelation of His splendor. I swam a while in the waves and let them carry me along. The dolphins clapped their praise as they bounced playfully amongst the waves, and clouds danced like angels in the shifting rays of the sun. I saw some land nearby, but I was enjoying myself too much to alight, so I continued on. The rain continued, and I started to become cold. Then, thunder rumbled its displeasure and lightning cast its sword across the sky. I was afraid, and the waves brought me under. This time, I spiraled down without hope. I was drowning and I yearned for the solid ground. I cried out to the Lord and He scooped me up from the ocean. I rested on the sand, recovering from the turmoil that had almost destroyed my heart. The Lord fed me and warmed me. I stayed a while in His presence, receiving His bread, the Word of His Truth. It healed me and gave me hope. It taught me about the storm so I was no longer afraid. It gave me strength to fight, and I found myself strengthened by its sustenance. The Lord pointed me to the path once again, and strapped my feet with readiness. He equipped me for the journey ahead and told me He would meet me at the end. The burden He set upon me was light, and I walked His path with joy as I recognised the many blessings He had taught me to recognise. They seemed to sparkle along the pavers of my path and if I stopped to search for them, they always made themselves known. The path was very long, and the journey would have been tiring, except that those little blessings kept my heart awake and searching, eager to uncover the next surprise. Finally, the path ended. It led me over a great cliff and I stopped, perplexed. 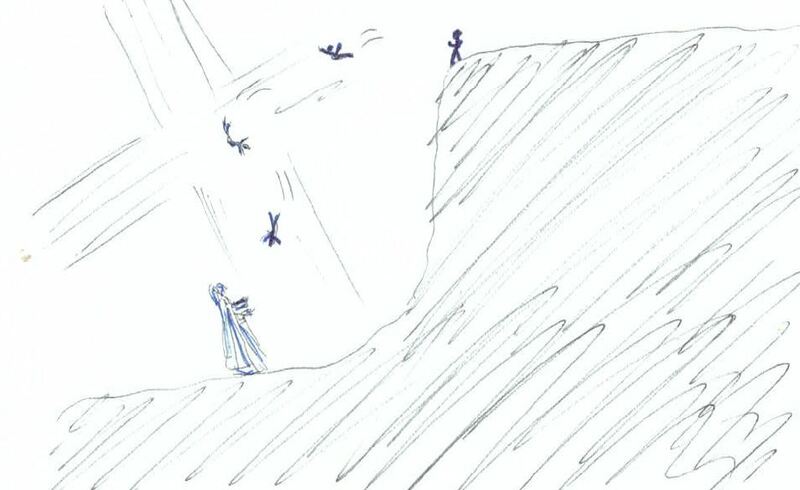 Surely the Lord did not want me to cast myself over this cliff. How would I know what was at the bottom? I turned around, but the path behind me had closed over. “No going back,” I thought. I had decided to follow Jesus with all my heart, and I trusted Him completely. Taking a deep breath, I stepped over the ledge and hoped in Him. Faith calmed my racing heart, and I felt the Lord’s peace grow stronger as I fell. His presence seemed like it was accelerating my fall, and I felt myself relinquish control. Suddenly, my heart was warmed, and I felt the great embrace of God draw me close. He broke my fall with His arms of love, and I heard the beating of His heart, the desire for all to be redeemed. This was His kingdom, this was His reward. I felt as one with the Lord Himself, knowing all His thoughts, understanding all His ways. His embrace gave everything I needed, and I knew He would never forsake me. I rested my head upon His shoulder and we swung on my Lord’s heavenly swing, watching the seasons go by. Many people climbed the mountain of faith, many dared traverse the valley of despair, many thirsted through the desert, and many found their own lonely waterfall. At the end, wherever their travels, the voyagers always found themselves at the same cliff. Some turned back, some refused to jump, but others leapt into the arms of God and received the Kingdom of His Love.